At Bethesda, you will find a welcoming community that is Following the Risen One (in worship and Bible study) with Something for Everyone (young, old and in-between) and Helping Anyone (near and far). There is truly something for everyone here at Bethesda, and our doors are always open for those who wish to join a Eugene Lutheran Church, and be a part of our Bethesda family. Come throughout the day on May 18th to help make Bethesda sparkle! At Bethesda, we have over a century of history as a Christian community that is rich in both worship of God and service to our local and global neighborhoods. We pride ourselves in being ordinary, fumbling and fragile people who borrow Jesus’ reputation and pray we are beginning to live up to it! Want to know more about what it means to be a Lutheran and what kind of church we are? Click here to learn more about our story, our mission, and our beliefs. We sincerely hope that in Bethesda you will find an inspiring place to worship, caring people with whom to build friendships, exciting challenges to help you grow in your spiritual life, programs and guidance to provide the support you need, and the opportunity to share your own special gifts and talents. We operate a Clothes Closet for families of the Bethel-Danebo School District through referrals from school counselors. 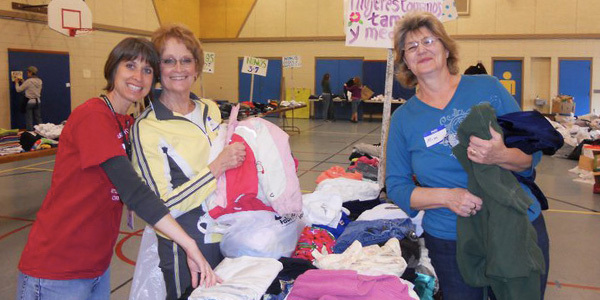 We provide quality used clothing, with new shoes, socks, underwear, and school supplies for all sizes, both male and female. We opened our doors for Food for Lane County in April 2010 for twice monthly distribution of food and other basic necessities. We primarily staff distribution with our own volunteers, but are happy to welcome volunteers from outside Bethesda. Operation Christmas Child is a ministry of Samaritan’s Purse. Our goal is to reach children with the gospel of Jesus Christ. God has used these little shoe boxes to open the hearts of children, and their families, and even entire communities.